In Russian cuisine, there are basically two types of dishes: those you immediately recognise, and others that keep you guessing right up to the first bite. Most fall into the first category: Shashlik, when you get down to it, is meat on a stick. Pelmeny is as Russian as a food can get, but is instantly familiar to anyone who has ever had wontons or ravioli. Other dishes, however, mystify even experienced foreign gourmands. Such is the popular dressed herring, which, in Russian, is provocatively named "herring under a fur coat". At first glance itґs hard to know what to make of it. 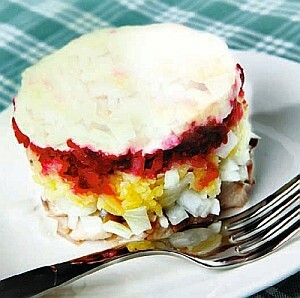 From afar itґs vaguely cake-like, while it is actually a type of salad, with one or more layers of salted herring, vegetables and eggs, and a topping of mayonnaise and grated beetroot lending a rich purple colour... and itґs probably the most popular of all Russian salads. It is found on New Yearґs tables, and often at birthdays and on holidays. Boil carrots, potatoes and beetroots until tender. Peel onions, then steep in boiling water. After 5 minutes, pour into a strainer and hold onions under cold water for 1 minute. Let boiled vegetables cool. Clean potatoes and carrots and grate into separate bowls. Peel and grate beetroots in a separate bowl. Remove shells and grate eggs. Chop herring into small pieces and add pepper. On a large plate, spread out a layer of grated potatoes, salt and cover with a layer of mayonnaise. Add a layer herring, then onions, carrots and eggs, salting each layer and topping it with a coating of mayonnaise. Repeat the process, without herring, until you have at least two layers. Cover everything with a layer of grated beetroot, on top of which you spread a thick coating of mayonnaise. A final layer of grated egg yolk can be added for decoration. Refrigerate for 5 hours and serve in slices, like a cake.